The slate of week 4 games did not seem like the best schedule going into this week, but Saturday delivered plenty of excitement, close games and upsets. Lots of trendy picks again this week, with plenty of our experts jumping on the Tennessee, Auburn, and Arizona bandwagons. We saw lots of tough results this week in the predictions game, but had a few standout performances from some of our competitors. Big winners this week included Tim Tebow (4-0), Paul Finebaum (4-1), Greg McElroy (4-1), Brett McMurphy (3-0 ATS), newcomer Chris Doering (4-1), and Brad Edwards (6-0-1, 2-0-1 ATS). Our official winner this week was Chris ‘The Bear’ Fallica, who put up a 13-3-1 record this week, including a BEEFY 6-2-1 record against the spread. He is printing money this year, so collect it while you can! Losers this week were many in number, and included Desmond Howard (4-7), David Pollack (4-5), Dari Nowkhah (1-3), and Phil Steele (11, 4-7 ATS) . Our official losers of the week will be Stanford Steve Coughlin, who went 3-7 (2-3 ATS) and Dr. Lou Holtz, who went 0-3. I have to stop and mention Joe Tessitore, because it is always funny when someone like Tessitore always stays neutral while piloting a show like SEC Nation. However, he went out of his way to let you know that he felt so strongly about Auburn winning this week that you should make note of it. Well, we did, and Auburn didn’t, so we are having a little fun with that. 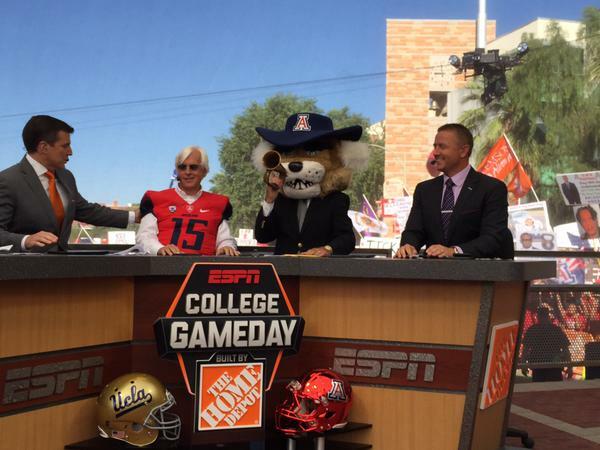 Other notes of interest: Lee Corso went 6-6 on the week, and 0-1 on his headgear pick Arizona. This week’s special celebrity guest Bob Baffert went a respectable 6-4 on the week, and our first ever special celebrity horse American Pharoah went 1-0 on the week. Charley the Cat also went 1-0 on the week going with UCLA, and Jennifer went 10-4 on the week. One highlight of note was Heather Dinich predicting Oregon to go down to Utah; the only soul who had the guts to pick that one. On a final note, Pat Forde put up what may be the worst pick of the year so far this week. He picked Old Dominion to beat App State, and unfortunately they went on to lose 56-0. Oh well, better luck next time. Check out the full slate of results below to see how your favorite (or most hated) personality did this week! Welcome to the way-too-late Week 4 edition of the College Gameday review. This week’s edition of College Gameday was broadcasting to your television set live in color from Tuscon, Arizona for the big matchup between Arizona and UCLA. Whenever Gameday is on the west coast for a Pac-12 game, it is always an early start at the show location, and this brings out the best (or worst) of the fans on most occasions. Maybe it is because only the crazies would get up that early to go claim a spot for Gameday, or maybe it is because they can basically go straight from the bar to the Gameday site, but comedy is always present for the 6AM local start. Let’s dive right into the sign game this week. 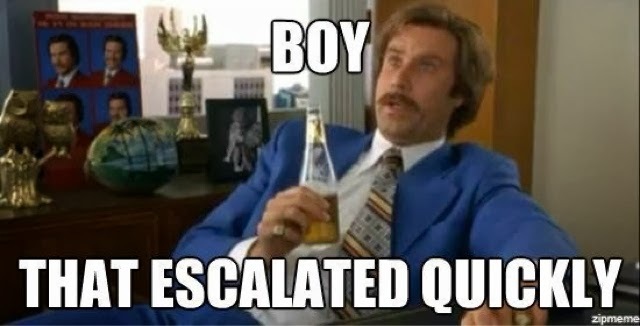 Strong contenders this week included “I LIKE SPORTS” and “I’m still drunk”. I was surprised at the lack of Lane Kiffin signs after the rumor mill started buzzing this week, but perhaps they were just confiscated before being allowed to enter the Gameday site. There was a massive amount of signs picking at the alleged minutiae of everyday life for our student athletes and their coaches. Lots of Jim Mora tributes including “Jim Mora waters his lawn” and “Jim Mora is gluten free”. 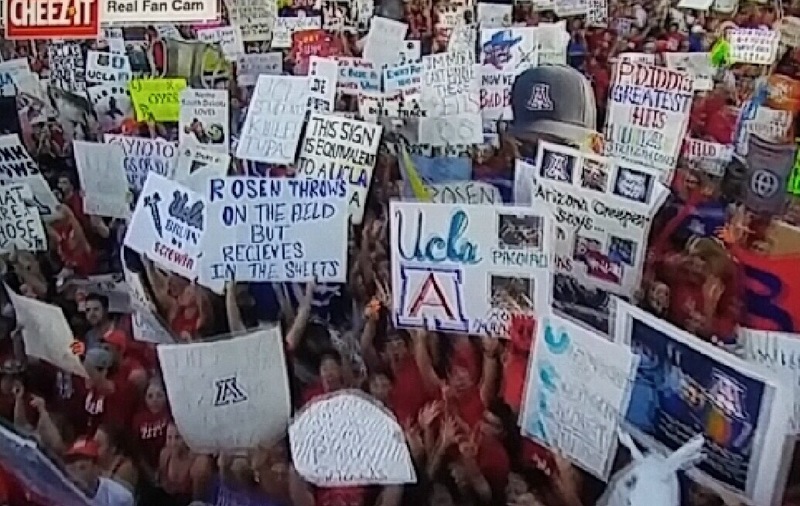 However, the target of more signs than anyone else was UCLA QB Josh Rosen. “Josh Rosen hangs out with his RA”, “Josh Rosen wears socks to bed”, and “Josh Rosen doesn’t even fast on Yom Kippur” were among the many featured. 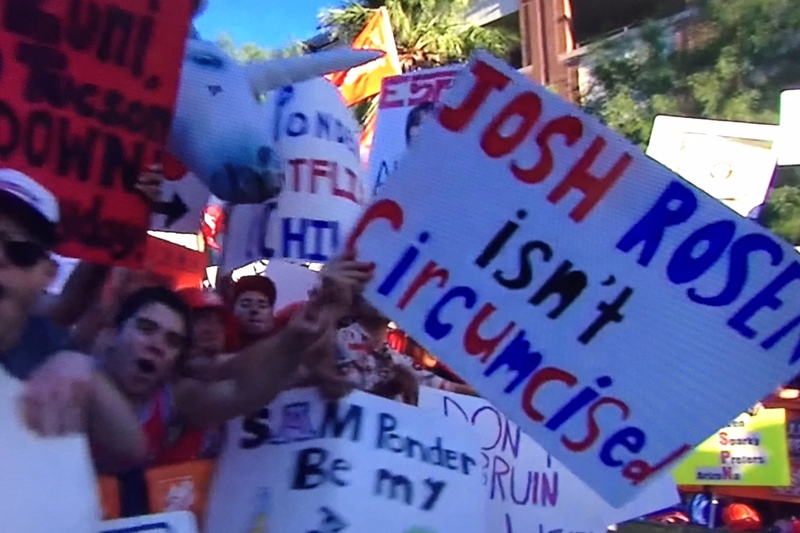 However this week’s co-signs of the week are a little bit edgier that we usually see on Gameday. For some unknown reason, there was a point early in the show where the crew was discussing the Rutgers/Kansas game. I only point this out because none of the Gameday hosts knew who the head coach of Kansas was except Rece Davis. Poor Clint Bowen. The Sam Ponder outfit of the week was a hit in our household this week. Jennifer gave it big props, so let us know what you think. Tom Rinaldi presented us this week’s touching piece about teams surprising some of their walk-ons with scholarships in different ways. This was pretty much a recycled segment from last season on the same subject, but I would be perfectly fine if they did one of these segments every year. Those of you who may have read my reviews before know I love to bag on Tom Rinaldi for sensationalizing certain pieces (see last week’s Lawrence Phillips piece) but seeing walk-ons get scholarships certainly gives me the warm fuzzies. Speaking of Tom Rinaldi, he and Gene W. did a quick piece on football players and their use of the ice bath. I point this out because not only did we get both of them shirtless, they went into an ice bath and then Tom Rinaldi disappeared as the crowd around him jumped in. We may never see him again judging by the full video. Today we got to revisit the inspiring story of USC deep snapper Jake Olsen. In case you’re new to the show, he had been featured in Gameday as a 12 year old USC fan who was going to lose his eyes to cancer. He had appeared as a special guest picker posting a 6-4 record picking with Corso and the boys. He had appeared as the only blind high school deep snapper I’ve ever heard of. And today he appeared as the newest addition to the USC roster as a deep snapper. He hasn’t gotten play time yet, but it is a pretty darn cool story with how much he has accomplished. He is playing major college football without the sense of sight. I am laying on a couch eating ice cream while blogging. It is pretty much the same thing I guess. 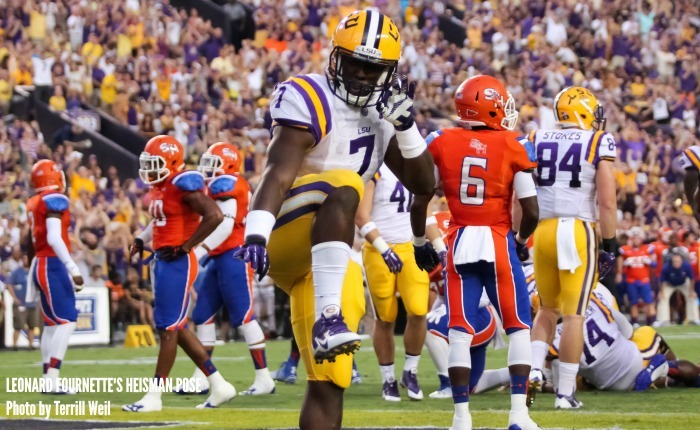 Gameday did a feature on LSU running back and Heisman hopeful Leonard Fournette. You probably remember his most famous moment when he performed a Heisman pose while squeaking out a win against Sam Houston State last year 56-0. Still a great segment, so check it out here. As the show started to wind down, it was once again time for everyone’s favorite segment, #YOUHADONEJOB!!!! Just watch the video because words do not do it justice. When it came time to get down to the business of picking games, this week’s special guest celebrity initially left me scratching my head. He is famous(?) Arizona alumnus Bob Baffert. I didn’t know who that was until Jennifer told me he was the trainer of Triple Crown winner American Pharoah. He arrived on a private jet, so he must be doing well in life. He seemed to have little idea of what is going on in football, and mostly picked games based on a friend or relative who went to a school. To nobody’s surprise he picked Arizona to win today. David Pollack had gone with Arizona earlier in the show, and Desmond Howard agreed. When it came time for Coach Corso to make his pick, he cut to a shot of American Pharoah picking the game and taking UCLA. To my knowledge that is the first time a horse has picked games on Gameday, but I will follow up on that research later. Animals must stick together because Charley the Cat went with UCLA as well, while Jennifer and Coach Corso both took Arizona in today’s featured game. This was the first time Corso has ever picked Arizona as his headgear selection, so this is quite a historical day. Enjoy your night and have a happy football! Good morning to all college football fans and degenerate gamblers. Its great to have you join us here as Saturday morning college picks come in. We have a handful already, and we will be updating all morning and into the afternoon as more picks and predictions come in. Check back later for a full slate of College Gameday picks, SEC Nation, and whoever else shows up as the games get started!